Anchor: Tuesday marked the second day of the long anticipated reunion of families separated by the Korean War. It also marked the first time that participants were allowed to spend time together privately, since inter-Korean reunions first began. Kim In-kyung has this report. 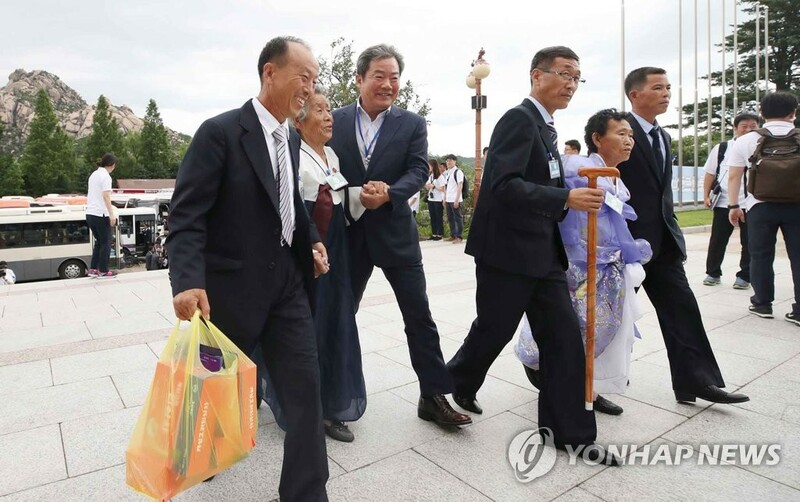 Report: On the second day of the inter-Korean family reunion on Tuesday, the long-separated relatives held private meetings at the North's Mount Geumgang resort. Eighty-nine South Koreans met some 180 or their loved ones from the North and updated each other on the last 67-years of their lives that they'd spent apart. "It was good... we met for the first time in 71 years... and the two-hour conversation we had there relieved us from the 71 years of longing. We talked about everything we wanted to talk about and there is no better joy than this. I am so thankful that they lived honestly." They are also said to have exchanged gifts while they spent some three hours in their hotel rooms. "I gave them a lot of gifts and I received a bottle of Pyongyang liquor and Mt. Baekdu whiskey. " "Meeting separately is so much better. It's more freedom." "I met my sister and my aunt's son with my cousin. I received gifts from them and felt very warm about it. I hope they live healthy. I was thankful and wanted to say, 'stay healthy.'" Following another two-hour group meeting and a dinner Tuesday, the war-separated families are scheduled to have a final luncheon Wednesday to wrap up the three-day reunion. During the current family reunion event, seven of the South Koreans are meeting their long-separated children from the North, while 20 others are reuniting with their siblings. The South Korean participants are mostly in their 70s and 80s. A 101-year-old man is the oldest among them. This week's family reunions come nearly three years after the last such event was held in October 2015. The current event comes as a follow-up to an agreement the leaders of South and North Korea reached in April to address humanitarian issues arising from nearly seven decades of division caused by the Korean War. In subsequent reunions planned to take place from Friday to Sunday, 83 North Koreans will meet their family members from the South. Some 57-thousand South Koreans are registered to be reunited with their families who might be living in the North. Kim In-kyung, KBS World Radio News. Minister: "Inter-Korean Economic Cooperation Should Bear Fruit in 2019"